MELVILLE, N.Y., April 2, 2014 — Shallow, creative depth of field, high-resolution and optimal low-light shooting capabilities are just some of the many reasons that large, single-sensor digital cameras have been kitted and rigged for use in nearly every application involving video capture. 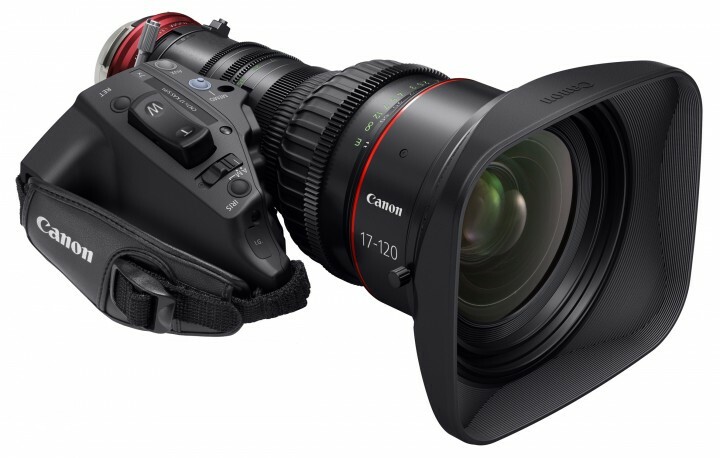 Further enhancing the versatility and adoption of these cameras into markets such as ENG (Electronic News Gathering), documentary, narrative production and special event coverage is the new CINE-SERVO 17-120mm T2.95 zoom lens from Canon U.S.A., Inc., a leader in digital imaging solutions. Canon U.S.A., Inc., is a leading provider of consumer, business-to-business, and industrial digital imaging solutions. With approximately $36 billion in global revenue, its parent company, Canon Inc. (NYSE:CAJ), ranks third overall in U.S. patents registered in 2013† and is one of Fortune Magazine’s World’s Most Admired Companies in 2014. In 2013, Canon U.S.A. has received the PCMag.com Readers’ Choice Award for Service and Reliability in the digital camera and printer categories for the tenth consecutive year, and for camcorders for the past three years. Canon U.S.A. is committed to the highest level of customer satisfaction and loyalty, providing 100 percent U.S.-based consumer service and support for all of the products it distributes. Canon U.S.A. is dedicated to its Kyosei philosophy of social and environmental responsibility.